MATHIHALLI MADAN MOHAN writes from Hubli: It is now clear as crystal. Either the chief minister of Karnataka, B.S. Yediyurappa, is mortally afraid of annoying the Reddy brothers, lest it cost him his chair. Or, he and the bigwigs in the BJP have a stake, direct or indirect, in the illegal mining happening on either side of the Karnataka-Andhra Pradesh border. This is the only inescapable inference one can draw from Yediyurappa’s dogged refusal to agree for a CBI probe into the illegal mining operations, which the Centre is desirous of having. Yeddiyurappa, mind you, is not required to initiate the process of a CBI enquiry on his own. Such a step has already been taken by his AP counterpart, K. Rosaiah. Acting on the recommendation of a committee constituted by the Supreme Court, which is seized of the matter, Rosiah has called for a CBI proble, notwithstanding the fact (or probably because of the fact) that one of the Reddy brothers, Gali Janaradhana Reddy, was a dear friend of the late AP CM, Y. S. Rajasekhara Reddy. 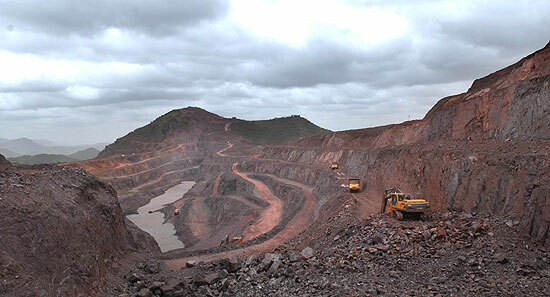 In a virtual indictment of the Reddys, the central empowerment committee said that the illegal mining be stopped in the six mines in Obulapuram and Siddapuram villages of Anantpur district, and that mining activities be resumed only after a demarcation of the boundaries of the mining leases was completed. It is this reference to the demarcation of the boundaries in the report of the CEC which brings Karnataka into the picture. The mines are located on the border areas and the allegation is that the company owned by the Reddys has encroached upon the mineral-rich areas outside their mining leases and is carrying out large scale illegal mining in the unclothed reserved forest areas. The Centre is inclined to accede to AP’s request for a CBI probe and it wants a formal concurrence from Karnataka to start the CBI enquiry. But Yediyurappa is dillydallying in the matter and has been stonewalling the request. It is true that the Reddys officially have no mining leases in their name in Karnataka. All their mining operations are conducted in the name of the company—Obulapuram Mining Company (OMC)—located on the other side of the border in Andhra Pradesh. But the fact remains that the Reddys have emerged as the movers and shakers of Karnataka from the financial clout that they have acquired through mining over the years. Several mine owners of Bellary openly talk of how the Reddys intimidate or overpower the lesser lot and dominate the mining activities. One such person, Tapal Ganesh, whose family has been in the mining operations for over three generations, has taken the issue up to the Supreme Court. Yediyurappa’s stand is surprising on three counts. One, whether Karnataka agrees or not, it cannot preclude CBI from looking into OMC’s activities in the State because of the reference to the illegal mining activities. It would be graceful if Karnataka agrees. Otherwise Karnataka would lose grace as CBI, by the very nature of its mandate, can press ahead with the investigation regardless. There are already reports that the CBI team has visited Karnataka to collect lot of documents required for the enquiry. And the report of the Lok Ayukta of Karnataka, which Karnataka wants to push under the carpet, provides enough grist to the CBI mill. Secondly, it was the BJP group, which had vociferously demanded a CBI inquiry when Janardhana Reddy, then a first time legislator, had hurled charges of corruption in the mining activities against the then CM, H.D. Kumaraswamy, during the BJP-JDS coalition in the days preceding the 2008 elections. Thirdly, as a leader of the opposition, claiming to champion the cause of the people, Yediyurappa was prone to demanding a CBI probe at the drop of hat and used to slamming governments which did not accede. But the illegal mining issue is more serious than all the issues on which Yediyurappa had demanded a CBI probe in the past. This is such a serious issue that no CM would have said “no” in the first place. As a matter of fact, the onus of demanding the CBI enquiry should have been on Yediyurappa himself. But he is weakly trying to stall the matter. Or is it that Yediyurappa wants the CBI enquiry without officially appearing to be favouring it as a matter of strategy to deal with his bete noire, the Reddys? Nothing can be ruled out in the mercurial nature of the internal politics of the BJP, where the wounds left by the Reddy sponsored rebellion against Yediyurappa have yet to begin to heal. This entry was posted in Issues and Ideas, Kannada & Karnataka, Mysore-Bangalore and tagged Andhra Pradesh, B.S. Yeddyurappa, B.S.Yediyurappa, BJP, Churumuri, Illegal Mining, K. Rosaiah, Obulapuram Mining Company, OMC, Reddy Brothers, sangh parivar, Sans Serif, Tapal Ganesh, Yedi, YSR. Bookmark the permalink. ← Why should they pay Rs 200 to play in their park? MLA’s on SALE !!! Now even our CM is on sale. Yes, Sir. This is the truth and a team of people are working towards that. why churumuri is always obsessed with yeddy and his reddys? illegal mining mafia is the face of RSS-BJP. RSS BY SUPPORTING ILLEGAL MINING HAS LOST ITS RIGHT TO TALK ABOUT PATRIOTISM. sangh parivar since ages have been supporters of toxic capitalism. time and again they have followed anti-farmer,anti-poor policies with mask of hinduism , now indians have taught them a good lesson by systematically marginalising them across india. With all this, people like Hutta still remain defiant. Can you please explain to us what does “Toxic Capitalism” mean? And since we are on the subject also please explain the “benevolent Communism”. Thanks in advance. raitha ,kaarmika,beevaru hariso jana naasha aagli , sirivantharu innu sirivantharaagli — this is bjp ideology meaning toxic capitalism. development with a human face is what congress and JD S stands for. communism– thumba complicated ,nanage artha aagilla. Good Joke. Last time I checked Obalapuram Kaangress supported mining in Bellary (DK Shi has mineral rights also) and Obalapuram in AP. Wrong to compare action taken by Mr Rosiah to that taken by Yeddyurappa. If Yeddyurappa takes action, he loses chair. If Rosiah takes action, Jagan is kept at bay, and his chair is secure till next elections. Of course, he might lose some Reddy votes in next election , but beeso donne tappuskondre noor varsha aayassu. Development with a Hooman face…hmm is that not what we followed for the last 60 years under congress rule, where did that leave us, pawning our gold reserve to raise money during PM Chandrashekar’s time right…so what is so good about it? WB,Kerala,Tripura all are communist states following the same proletarian model of administration, I wonder where has that left these states? @Mandyada Gande aka ex PM Devegowda’ group? Houdu, houdu. avaru namma swantha relatives. thumba close relativesri. alla, this churumuri always keeps posting some irrelevant news/meaningless photographs. There are so many problems faced by Bengaluuru/Karnataka/India. All those beautiful trees in Bengaluuru are cut down. Farmers land is grabbed in the name of development. Many farmers are dying unable to repay the loans. The quality of education is low. There is rampant corruption everywhere. Many places have become so unsafe for women. The divid betwen rich and the poor has increased. environmental (water) pollution due to BT industries…..